A tipster informs us that UberMedia, the company behind social networking apps like Echofon and UberSocial / Twidroyd, has unintentionally pushed its new iPhone application onto the App Store (iTunes link). This is plausible, because the Chime.in website isn’t accessible yet at the time of writing, although the support pages appear to be live already. So is Chime .in the oft-rumored challenger to Twitter, which UberMedia has had run-ins with in the past? UberMedia has always denied that it had plans to launch a competing social network, so it’s a question worth asking. And the answer is no, not really. Chime.in is described on the support pages as an online and mobile network organized around interests, or an ‘interest network’ to keep it brief. Still according to the support pages, Chime.in was “was created for people who are active in social media and looking for a way to engage in conversations and more deeply interact with content related to their interests”. Basically, it lets people build and maintain communities around their favorite topics. Chime.in’s technology also identifies users who Chime about topics you’re interested in and recommends them, as well. Chime.in’s search function lets you search by person, interest and community so you can choose how you want to engage around a topic you care about. You can also follow interests, people or a person’s specific interests to make it as streamlined as possible to digest content and engage with other users. Updates on Chime.in, dubbed Chimes, are rich media-enabled, so you can include photos, videos, polls or links and users can view them directly from your stream. Posts can also be broadcast across other social platforms (Facebook, Google+ and Twitter) or saved for users to read later. At launch, everything you do within Chime.in is public, although the company says on its support pages that it intends to “start layering in more privacy controls” in the future. I’ve also found a page that clearly shows applications for Android and Blackberry are also in the works (see screenshot below). How is Chime.in different from existing social networks? All other social networks are all about connecting with people. Chime.in is about connecting with interests and people – it’s an interest network. It lets you tailor the content you see and search for to the topics you care about, so you aren’t bogged down sorting through posts you aren’t interested in. Chime.in is also designed to create a richer social experience by integrating multimedia and making it easy join interest-based communities and to engage in real-time conversation. 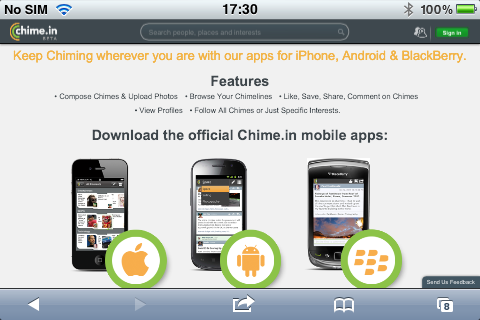 Why would someone use Chime.in instead of dominant social networks like Facebook and Twitter? – One of the great things about social media is that you’re free to use any platform you want. Chime.in was created to address the need for relevance in social media. As such, it wasn’t designed to replace any networks, but to enhance the social media experience with a platform tailored to a clear, specific need. Given that we allow people to publish Chimes to Facebook, Twitter and Google+, we fully expect not to replace other networks, but to be additive to the ecosystem. Sounds like they listened to Twitter attentively. 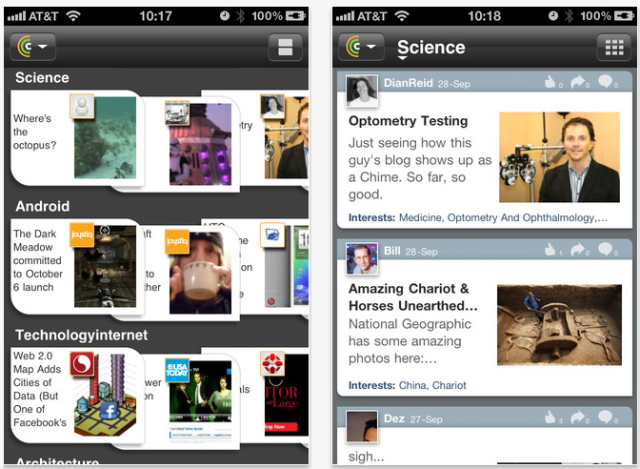 You should be able to give the free app a whirl now if you have an iPhone (iOS 4.0 or later required). UberMedia was founded in early 2010 as TweetUp (later PostUp) by serial Internet entrepreneur Bill Gross. The company has raised close to $27 million to date.